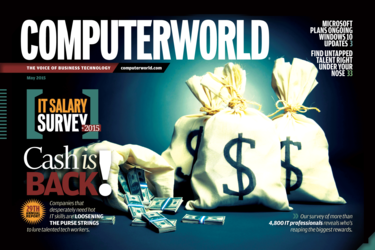 Read the May Computerworld Digital Magazine! Our 29th annual special report lists current salaries for more than 40 IT job titles and shares insights about the mindset of the more than 4,800 tech professionals who took part in our survey, revealing their top concerns, career prospects and more. Find out about trends in pay, the state of the job market and today’s hottest skills. Companies that desperately need hot IT skills are ratcheting up salaries and bonuses to lure talented tech workers. Here’s how to grab your fair share. With salaries up, unemployment down and open positions galore, it’s a great time to be looking for a job in IT. Security pros are in demand, and companies are willing to pay top dollar for the right candidates. Do you have what it takes to succeed on the security career track? Two IT-related careers make the list of 25 occupations where the pay gap between men and women is narrowest. With the advent of Windows 10, enterprises will have to rethink the way they evaluate Microsoft operating systems, because the company has a new approach to development that involves ongoing upgrades. Competition for top talent may be tight, but Paul Glen says you might be ignoring great resources in your own organization.